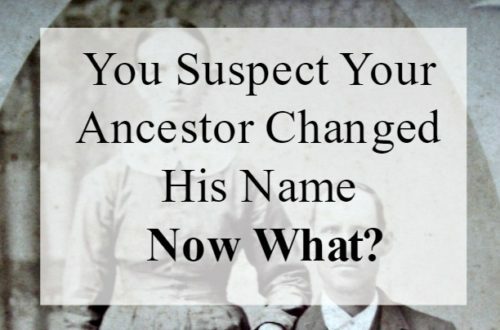 31 Days of "Out of the Box" Genealogy Tips - Genealogy Wikis | Are You My Cousin? 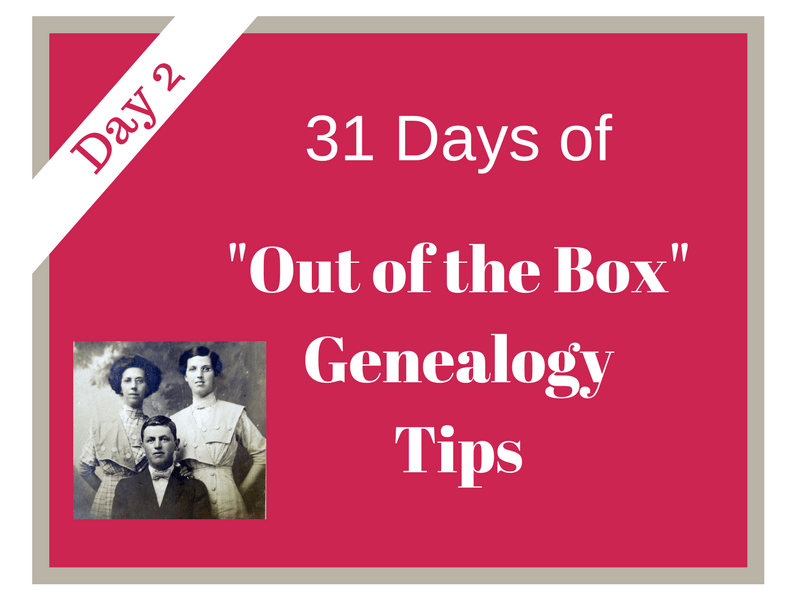 If you missed Day 1 in the “31 Days of “Out of the Box” Genealogy” series, check it out here! Now that you are caught up, let’s take a look at Day 2! DAY 2 – Explore Genealogy Wikis! As defined by Dictionary.com , a wiki is a website that allows anyone to add,delete, or revise content by using a web browser. Think of it as a type of crowd-sourcing on a particular topic. In our case, the topic is genealogy. Is everything on a wiki page – genealogy related or otherwise – 100% correct? No, it’s not always correct, BUT a genealogy wiki is a good place to get basic information about your topic and/or to gain clues to help jump start a particular genealogy research project. FamilySearch Wiki can be searched by topic or by location and is the one I use the most. When beginning genealogy research in a new to me state or county, I first go to the FamilySearch wiki page for that area to learn what genealogy resources are available for that area. WikiTree is a free site working toward the goal of creating a single family tree. Researchers have the ability to collaborate with other researchers on direct and collateral lines. Wikipedia is not a genealogy specific website, but it can be used to search for genealogy clues to your family line. You can use it to gain information about locations you research and potentially even family lines. REMEMBER a wiki’s information is only as good as the person’s knowledge who added it. Use wikis to search for clues. Verify the information yourself. Look for sources and citations as you evaluate the accuracy of a wiki page. I have just joined your web site. 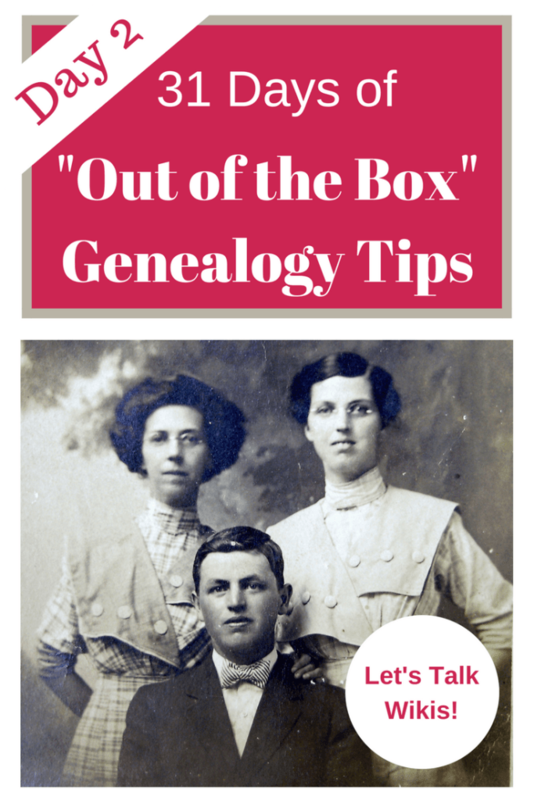 I am anxious to work through the 31 days of Out of the Box Genealogy Tips but I can’t find all of the posts. At age 93 I have to work with what is on the computer. I am no longer able to “get up and go”. I love working with genealogy–I have been working with it since the mid 1960’s and still get kick out of finding what I need to fill in my work. Mary Frances, I’m so glad you found the 31 day series helpful. All of the posts are there on the website. Check the bottom of the last post in the series for links to all of the previous posts. I’m also getting a page together with all of the links, too.